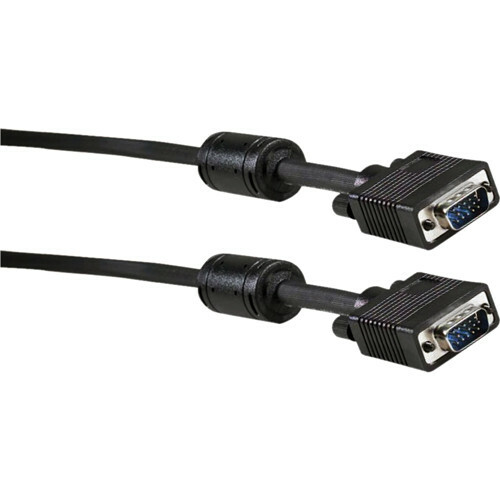 The CSV-HDMF-10 VGA/XGA Value Line M/M Cable (10') from FSR is a general-purpose VGA/XGA cable that is 10' in length. It features an HD-15 male on both ends. This cable offers flexible, black-molded, strain-relief HD connectors with a ferrite core. It also features a high-flexibility, black jacket and tinned, copper-braid shielding with an aluminum-foil wrap that bolsters signal integrity. This unit is manufactured from UL-approved cable. Box Dimensions (LxWxH) 7.2 x 6.3 x 0.8"